Here are the much awaited Lakeland Airport revival photos. Todd Bentley was on fire, as was the rest of Fresh Fire ministries, Roy Fields, David Tomberlin, Jim Drown, and the rest of the team. 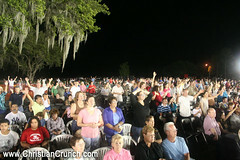 God Tv (god.tv) delivered another global broadcast of this history-making event: 15,000 people from around the world stormed the Lakeland Linder Regional Airport for a gorgeous, all-night meeting that went down in the history books for the shear fact of exposure. In a divine appointment at lunch today running into Pastor Stephen Strader, he mentioned that now ALL the Christian media is attempting to broadcast, and that CIM was broadcasting the revival in the later parts of the afternoon around the country. The media delivery is what sets this revival apart! Also be praying for a new location for the revival as they consider obtaining an inflatable dome to house the hungry souls! Stay tuned for more details. You can obtain FREE high resolution images of the revival by requesting any you like at photos@christiancrunch.com. This entry was posted on Tuesday, May 13th, 2008 at 7:58 pm and is filed under belief, Christianity, Church, faith, florida revival, God, godliness, healing, holy ghost, holy spirit, lakeland regional airport, outpouring, Prophet Bob Jones, prophet paul cain, Revival, revival photos, theology, ThoughtLife, worship. You can follow any responses to this entry through the RSS 2.0 feed. You can leave a response, or trackback from your own site. I live in New Zealand (country off the coast of Australia) I am planning on getting to the revival in Lakeland Florida. I need contact details: When I get to the Lakeland Linder Regional Airport, Florida. Do I get a bus or a taxi to where ever the revival is. How do I get accommodation? There will be two of us (mother and daughter age 12 ). What is the address of the conference? What times are the meetings? Is the last meeting on 23rd Aug 08? Are the meetings on every night?